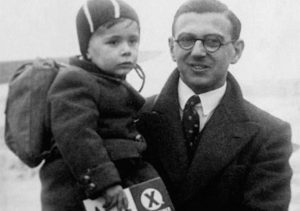 In 1938, Nicholas Winton was a young stockbroker in London. 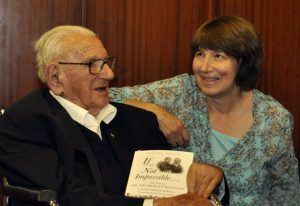 Keenly aware of the events unfolding on the continent as Jews were under threat in Nazi-occupied Europe, he hatched a plan and rescued 669 Jewish children from Czechoslovakia via train, a transportation known as the Kindertransport. Dubbed the ‘British Schindler’, Sir Nicholas, as he later became, also organised for each child to have a foster family and home on arrival in England. Sir Nicholas’ daughter, Barbara gives talks and has written a book remembering her late father’s incredible achievements. We talk to her here about this and of the legacy he left behind. What prompted your father to take action? It was counter intuitive that he should have done it. He came from a German Jewish family background so he witnessed in the 1930’s members of his family fleeing from Germany, so he knew that things were not good. The other thing was that he was political, he knew people in the Labour party and they would speak and he was very aware of what was happening. But it took personal experience, witnessing the conditions refugees in Czechoslovakia were living under, to make him decide to act. At Christmas in 1938 your father joined a friend, who was already volunteering in Prague, what happened next? He went out to the refugee camps and he was appalled, they didn’t have enough to wear, not enough to eat, there were children without shoes, all trying to keep warm in this snowy, wintry refugee camp and this was what spurred him into action, he thought it was intolerable. Other organisations were trying to help in other ways but nobody was focussing on the children and he found that already, even though he wasn’t authorised, he was just one individual, people were coming up to him asking him if he could take their children away so he started to compile a list. Your father took this list back to the British Committee for Refugees from Czechoslovakia in London, however was told to wait and see if the organisation who were bringing children out of Austria and Germany would do so with Czechoslovakia, yet he wouldn’t put his plans on hold, why? He believed war was going to happen and that Hitler was going to carry out threats he’d already made. Not only that, while he was in Prague, he’d found a map that drew out on paper Hitler’s ambitions for all the countries in Europe and the dates that he would invade them, it was an extraordinary thing, mind-blowing actually. So he decided to go to the Home Office anyway and he took British Committee for Refugees from Czechoslovakia note paper and he put on it, ‘Children’s Section’ and he nominated himself the honorary Secretary and having been told by everybody that the Home Office wouldn’t agree, that this would be impossible, it was very easy and they said yes that would be fine, you just have to have two conditions, one was that they had to have a family for each child, the other was that they had to provide £50 for repatriation. Back in Prague, what was the Nazi’s response to this project? Another volunteer, Trevor Chadwick had agreed to help in Prague if the project went ahead. He was negotiating with the Gestapo which was difficult but actually, although they made life awkward, the basic premise that he was taking Jewish children and taking them to England was fine by the Gestapo because that was the Nazi intent, to rid Europe of Jews. What was the reaction in England given that it was the time of the Great Depression and that the country was faced with refugees coming in? Well it was the same as it is now, that was what’s so extraordinary. Nothing has changed really. There were newspaper headlines saying we don’t want enemy aliens here and certain newspapers today say the same stuff. People were saying we don’t want Jews coming in, taking our jobs, causing trouble in the streets. I read out newspaper reports when I give my talks and not only are they shocking but they are so resonant with what’s going on today. However, many took in children. If you take in a refugee child today you are funded but back then you weren’t, you had to take it all out of your own pockets. There are stories of some families who took in a child and sent their own child away to a grandparent or aunt because they didn’t have room and those who really weren’t well off but felt it was their duty to help. Sadly the final train didn’t make it, was this an overriding regret for your father? I think it was, yes. The biggest transport they had organised so far was for 250 that was due to leave on the 1stSeptember, 1939 but because the Germans invaded Poland that day they closed the borders and the train wasn’t allowed to leave and most of those children ended up in Auschwitz very sadly. Your father met some of the Kinder (children) in his later years. How did this shape the rest of his life? He was someone who loved people so to have this extra layer in his life of these interesting people who told him about what they’d done for the rest of their lives, he found very rewarding and he built special relationships with some of them. I have a good relationship with many of them, they’re like an extended family. Your father didn’t believe he had done anything extraordinary, that it wasn’t worth talking about, however how does his legacy continue today? The number of descendants from those he rescued we think number about 7000. Many of them feel they have been given a chance and that they should do something very positive in the world to repay that. Many were very successful, very caring and have given huge contributions to their communities. My father’s story is really that if you try then you don’t know what you might achieve but if you don’t try then you won’t achieve anything. So his view that people never learn anything from history and that it’s not worth talking about I felt like I had to beg to differ and say to him look your story inspires people to get out and get involved. Remember people at the time didn’t realise what the final destination was going to be for those families and that’s where we can see the connection with today. People don’t need to be faced with mass murder to need help; terrible conditions, no future, nothing to look forward to, no education, this was quite enough to motivate my father. Insiders/ Outsiders is a nationwide arts festival taking place from March 2019 to March 2020 to celebrate refugees from Nazi Europe and their contribution to British culture.